Voice over the Radio : "Attention! This message is for the Army of the Vanity Box. There is an information of possible security breech. Just a inch south of St Nose Peak, strong dry winds are going to attack from everywhere. This attack will make the area non-kissable. This is an emergency and requires closest attention. The situation is Scale A. Out." Message from Army of the Vanity Box : "Roger. All members of relevance will be sent to the site. Out." This was the first lip balm of my life. Something I started using at collage. This is my 4th or 5th tub. How I used so much? Because at times, it even acted as a moisturizer for specific dry points like elbow. I still love the strawberry smell in this one. Also, I was kinda addicted to applying lip balm. Something that I learnt in collage was that things are shared - A lot. Then I realized I had to get something in tube to make sure someone is not using my lip balm. Then I got this. Actually I got something that had no color had smell. This one is the smell version. They are the vintage Baby Lips of Maybelline. Not sold anymore and this one is expired. I have kept it to remind me some beautiful personal things. One of them being that my mom predicted it that time that I would be a beauty product junkie and I became that true to her words. But I went back to strawberry with this one. I got it inside a strawberry gift set - a gift set that I got for myself in Diwali 2 years back. This one is thicker and smoother than the Lotus one. This is the one that changes color and I am always amazed. I used everyday in last winter. It turns from clear to bright pink on lips and the stain remains for a long time. The whole look become very natural. I will surely repurchase this one. The Peach one is hopeless. The color of peach one does not change much on me. My love. If I have chapped lips, I search for only this one. It has made my lips to chapped to supper soft and yummy in 30 mins. I apply it over night whenever there is an indicating of dry lips. Reviewed HERE. I am excited about Sephora in India ONLY because then I will have my access to all Burts Bee products. Rank Protector with Coconut Smell. Coconuty warm smell that comes inside in tin slider. But the smell does not last longer which gives me another opportunity to open the slider. It says tinted balm on the box but what kind of tint is white? In simple words, it gives you no color. Luckily I got it as a giveaway prize. Read about the review HERE. I got it as a free gift from a blog sale. I haven't used it so far. The smell is not something that I can tolerate - very artificial. Not Photographed here - The Body Shop Dragon Fruit Lip Butter, Maybelline Baby lips in Mango, Maybelline Baby lips in Coral Crush. What I am going to to now is what I do every winter - I am put the glosses and balm in every room, office drawers and bags. And speaking of office drawers, my colleage recenly commented - You keep your house in here!!??? A Weird Indian Tip To Stop Chapped Lips For Ever -This is a fail proof and always effect tip to stop your lips from chapping. No drying and no flaking. All you have to do to apply a drop of oil on your belly button. It works all the time. Tell me if it didn't worked! Anything I want to add? I am not a lip balm/gloss lover but I have decided that I get those in nice packaging like EOS one or the Owl set shown below. Which is your favorite lip balm to fight with chapped lips? Do try the tip...I am sure it will help. 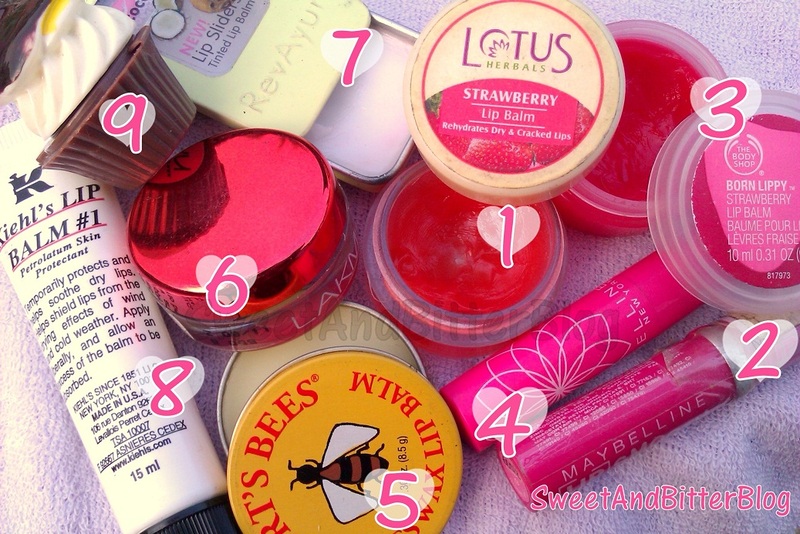 great lip balm post! I really want to try the burts bees lip balms and really hoping that the Sephora shop opens up soon here. At the moment, surprisingly I am loving the VLCC Mango lip balm. 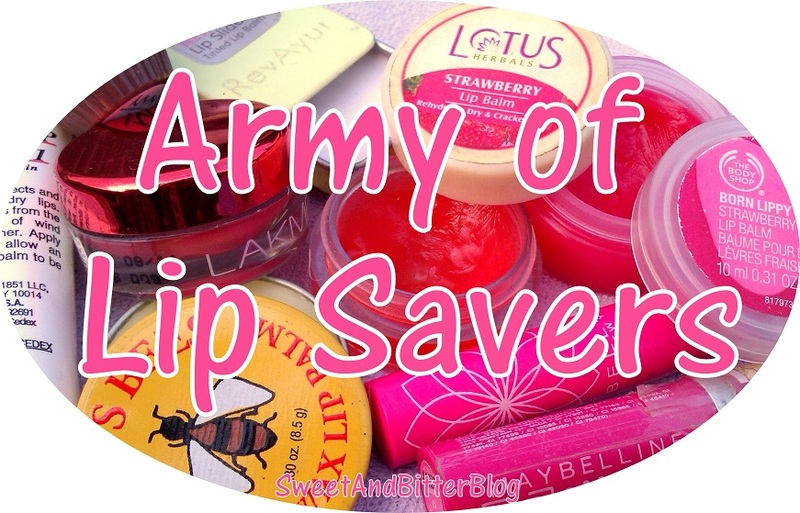 My other fav lip balm is the The Body Shop lip balms ^_^. I have never tried VLCC lip balm. Which ones do you like from TBS..the creamy ones or balmy ones? What an entertaining post! Oil on belly button- reallyyyy??? yessss....try it!! It always always always works..
Love the way you've written this post with Rank and Uniform given to each balm...very witty. For me the thing that works best for chapped lips is exfoliating them with sugar+lemon juice and applying L'Occitane's 100% pure Shea Butter. It works better than any other lip balm. Thanks for appreciating dear. I have tried exfoliating with sugar and lemon but i end up eating most of it :) I will try L'Occitane's 100% pure Shea Butter. Heart a lot of good words about it. wow!! !....great post, the belly button thingie works yar!! you have left out vaseline though..its real solid when everything fails! !..not just for lips but elbows arms feet!! I have tons of them but by far I feel like the Nivea kiss of moisture is the best n vaseline original is also similar. i haven't tried Nivea kiss of moisture. It is fragrance free..right?